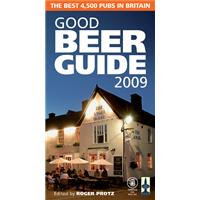 Today sees the official launch of the 2009 Good Beer Guide, CAMRA's flagship annual. No jolly this year for the journos, just Roger Protz encamped at HQ fielding up to 20 radio stations for interview. The press coverage on the back of press releases issued yesterday seems strong with even The Sun city pages (sic) covering the guide together with our new sat-nav and text services. The guide is available here for £10 + postage for CAMRA Members against the usual cover price of £14.99. However, I have already been alerted to this by a prudent fellow hop head.